One of my favorite desserts is chocolate pudding, the pudding I like has the consistency of a flan. Growing up in Norway I am used to one kind that you can buy ready-made, and it is produced on an industrial scale, but to me it brings back childhood memories. Most recipes I have seen for chocolate pudding contains starch and is more mushy in consistency. 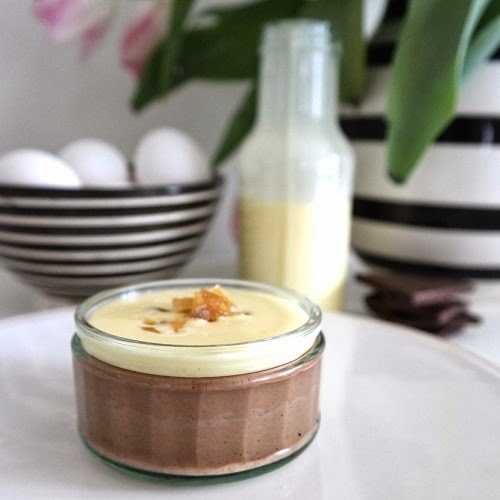 This chocolate flan is made with eggs, milk and chocolate. I saw a food truck program on TV were the cook made a flan almost like this one and I thought, why didn’t I think about this before, then I would have gotten the pudding I like. Cut the vanilla pod in two and scrape out the seeds, combine the pod and the seeds with milk, cream and powdered sugar, and bring to a boil. A soon as it boils pull the hot mixture from the heat and melt the chocolate in the milk and let it cool until you can stick a finger in without getting burnt. 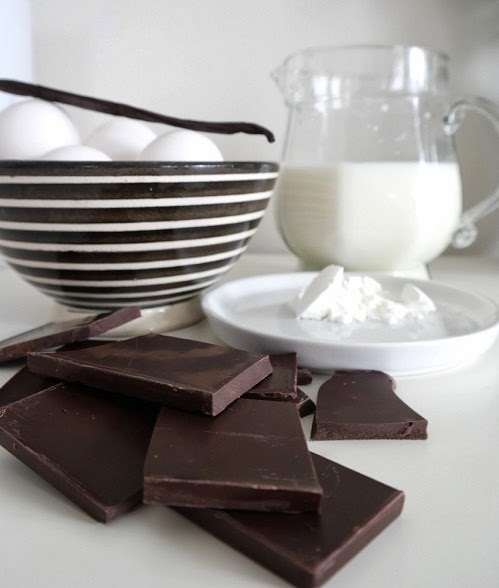 Place the eggs in a bowl and whisk them lightly together, then pour chocolate mixture in to the egg while still beating the eggs. Beat until everything is mixed together. Strain the mixture and pour the mixture into individual cups or in a larger tin. Place the cups or tins in a deep pan with water coming halfway u the sides, cover the pan with aluminum foil and but it in the oven for 25-30 minutes at 150 C, how long depends on the size of your cups and tins. Check the flan after 20 minutes, gently shake the pan and if the mixture sways lightly in the middle of the cup/tins it is the finished. Let the pudding cool for at least two hours, but it is best if you let cool and set for a whole day. Sever with vanilla sauce and chopped candied ginger. Split the vanilla pod lengthwise and scrape out the seeds. Place milk, cream, half the sugar, vanilla bean and the flavoring in a saucepan and boil the mixture. Whisk the egg yolks with the remaining sugar in a bowl and whisk until most of the sugar has dissolved. Pour the hot milk mixture over the yolks while you whisk. Pour everything back into the saucepan and heat the mixture up gently over medium heat, stirring constantly. The mixture should thicken slightly, but do not boil. The sauce is ready when you dip a spoon into the sauce and it sticks to the spoon. Strain the sauce into a bowl or a small bottle and refrigerate.Make this while you are baking the pudding, and let it sit to allow all the flavours to marry.